Driving to the Ends of the Earth continues Coates' ongoing interest in urban and automobile space and specifically the relationship between cinematic vision and the moving image seen from a car. Our experience of cities – especially car-centric ones like Perth – is strongly shaped by seeing and moving through them inside of cars. Acting as a wrap-around cinema screen, the car window provides us with a seated, glassed-in view of the landscape that strongly shapes our ideas of it. Driving to the Ends of the Earth was shot against a green screen to create the illusion of a stationary car moving through space, and also references the pre-CGI cinematic technique of rear projection. The car windows act as screens, through which a continual stream of catastrophic events play out, appropriated from footage caught on dash cams and uploaded to news and You-Tube channels. Seemingly oblivious to the scenes of disaster, the driver and her dog carry out everyday tasks, safe in the autonomous zone of the automobile to eat, clean, exercise, urinate and listen to music. 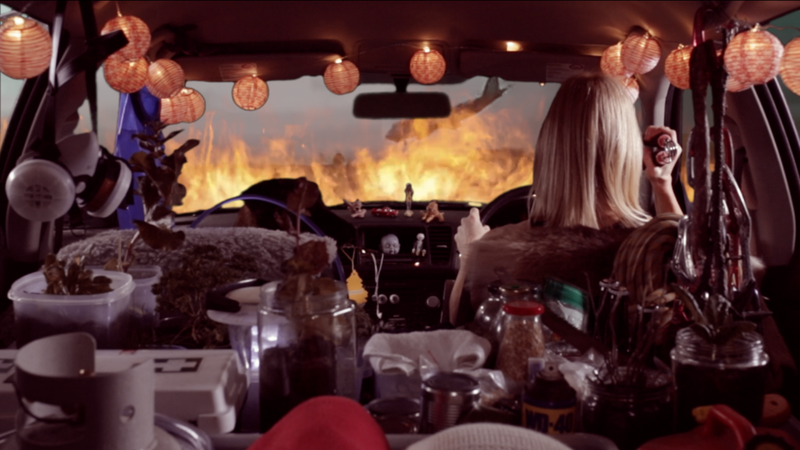 The car, which is packed with supplies, equipment and decorations, acts as a kind of flamboyant mobile biosphere, hurtling through the impending yet surreal doom of climate catastrophe, civil unrest and minor apocalypses. Commissioned for Inanition: A Speculation On The End of Times, curated by Laetitia Wilson at Success Gallery in Fremantle, 2017. Official selection in Revelation Perth International Film Festival, 2017 and Channels Festival, Melbourne, 2017.